A photocall yesterday at the station booth. I popped along to get a quick quotes from Geoffrey Theobald, who is Chair of the Environment committee on Brighton and Hove City council (and former Mayor). 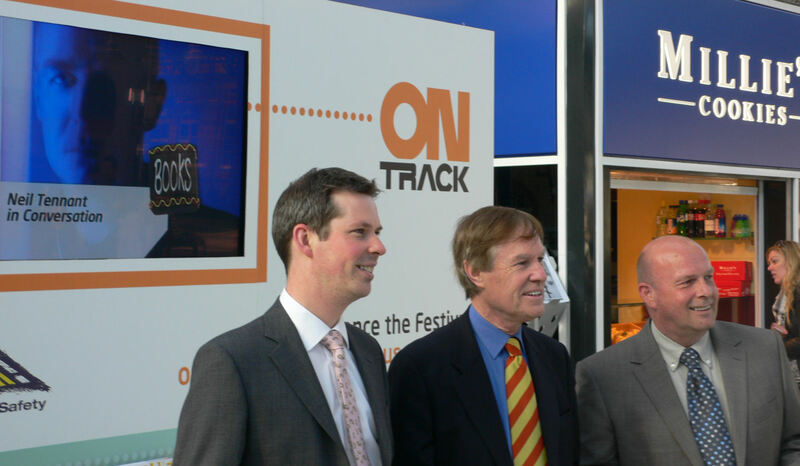 Andrew Comben, Festival CEO who I’ve previously interviewed, and Chris Hudson of Southern Railways. My colleague Simon was taking photos, and I joined in, if only to be able to menace Andrew Comben with a camera again. I also met Kath Travis, who is from journey on. For some reason I didn’t know about this before, but it is a marvellous site that lets you know where your bus is, when it’s to be expected, the traffic situation, even the carbon footprint of your bus journey. Amazing. Just another sign that Brighton is one of the most sustainability minded cities in the UK, and that its festival is part of that mix. This little booth is one sign of joined up thinking, and an example of the new kind of partnership that could ultimately help us all. Below Andrew, Geoffrey and Chris joining forces for sustainability. This entry was posted in Uncategorized and tagged Andrew Comben, Brighton, Chris Hudson, Geoffrey Theobald, journey on, Kath Travis. Bookmark the permalink.